It has neither corkscrews for wheels nor chubby wings to fly it above the Caspian. 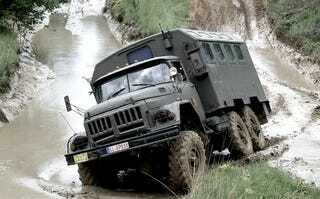 Still, the ZIL–131 is one badass Russian military truck. In Russia, Zil Screws You! The 131 is not a fancy truck by any means. It’s a basic 6×6 cargo unit with endless possible configurations, including a trailer for surface-to-air missiles. It is powered by a 6-liter gasoline V8, which—like every Russian military engine worth its salt—can run on pretty much anything that features carbon atoms bound to hydrogen atoms with a fancy for oxygen. The beauty of the 131 lies in the laconic manner it handles obstructions. Aided by a ground clearance of over a foot and a maximum fording depth of 4'7", it takes to bad terrain like an SR–71 to an extra continent to cross. Just make sure you’ve got your logistics nailed down: all that off-roading comes at the price of a very Russian fuel economy in the range of 1–2 MPG.